The Nissan Qashqai continues to be the bestselling car in Ireland with 3,980 new buyers making it their car of choice up to the end of September this year. Nissan Ireland says that demand for the car remained high throughout the third quarter of the year and it is now the bestselling car model in no less than nine counties where it enjoys a commanding share of the market. Over 1,650 units of the car have been sold in Dublin, where demand is at its highest and where the Nissan Qashqai’s reputation as the undisputed leader in its segment is heavily underlined with 16.8 percent market share. 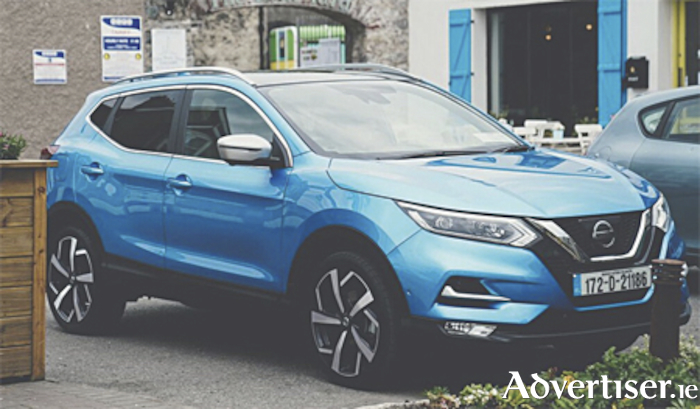 The Nissan Qashqai is now Ireland’s bestselling crossover of all time with over 50,000 units sold since its launch just over ten years ago. “We are delighted that the Nissan Qashqai continues to be the undisputed leader in its segment. It is not only the number one selling in car in Ireland but has firmly established itself as the number one selling car in a growing number of counties. “Demand is being driven by the reputation and quality of the car and by the choice of petrol and diesel engines available across the entire Qashqai range, the recent upgrades and significant premium enhancements in the car along with Nissan’s Intelligent Mobility features, which are changing the way that people interact with their cars, have also played a large part in customers choosing the Qashqai. “Drivers are looking for new levels of driving flexibility and the technologies such as Intelligent Emergency Braking with Pedestrian Detection, Intelligent Park Assist with Rear Cross Traffic Alert and Still Assist and the ProPILOT autonomous drive technology in the Nissan Qashqai are attracting buyers and driving sales,” James McCarthy, CEO of Nissan Ireland, stated.